From time to time, we share our experience as an inbound marketing agency by defining some inbound terms in an effort to help all our marketing managers, directors of marketing, and anyone interested in getting more traffic and leads from their website. A big first step to getting the right kinds of leads from your site, is to make sure your content gets found on Google. 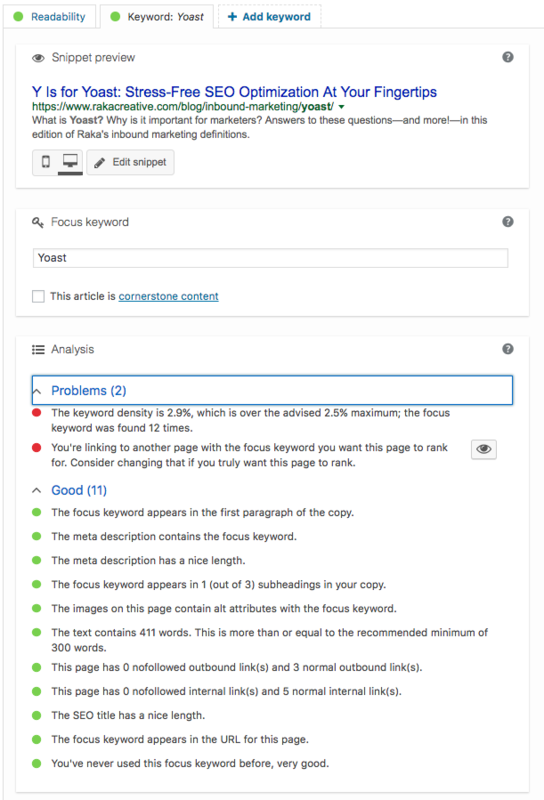 One great way to do that, if you’re using WordPress, is to take advantage of Yoast, a borderline magical plugin that can help you produce readable, keyword-focused content across your website. Of course, you have to know how to use it first. Yoast’s WordPress plugin is a tool that does most of your SEO work for you. Rather than spending precious time hunting down all the errors, you need to fix or the improvements you have to make, you can rely on Yoast SEO to analyze the page in real time and provide digestible feedback. Do you know anyone who wouldn’t want help in those areas? Well…. Some marketers are SEO mavericks; they like to optimize web pages their way and they do it with gusto. Yoast is not for those people. Yoast is for people like me, who don’t want to take chances when it comes to search engine optimization. I am perfectly fine with having a plugin check my work and tell me how to improve SEO for the content I write for Raka. Ta-da! A complete rundown of every place I can optimize this post. And the bulleted scores are simple—red and orange need improvement, green is good—so I know just where to focus my attention. Once all those lights turn green I can be confident the post is properly, thoroughly optimized. In it, Kelly gets into the nitty-gritty of how to take advantage of the Yoast plugin. From focus keywords to content analysis, she not only explains why each SEO aspect is important but describes how to make peace with it. And isn’t that what we’re all after anyway? Yoast SEO is a plugin for WordPress that guides the technical optimization of your website.